What is a lzo file and how do I open a lzo file? An LZO compressed file is integrated with file archiving specifications that can reduce the size of all files stored in the compressed file, and the LZO format is the encoding standard used for these LZO compressed archives. These compressed files may contain one or more files, or even groups of folders with several files of different types and sizes. The size of a compressed file is smaller than the combined size of all files and folders stored in an LZO compressed file. Affixed with the .lzo extension, these LZO compressed files are stored in the LZO format and are specifically implemented with compression specifications used by the LZOP file compression and decompression software. The compression functionalities integrated into this file compression and decompression program are derived from the Lempel-Ziv-Oberhume file compression library. Quicker decompression speed and higher compression ratios are also integrated into these LZO files. 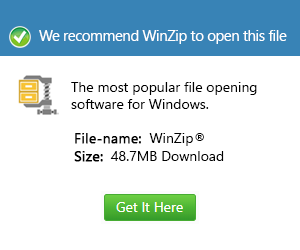 Users of computers running on Microsoft Windows-based systems can install and use the Corel WinZip 16 Pro software to start creating, decompressing and extracting the content of these LZO files.